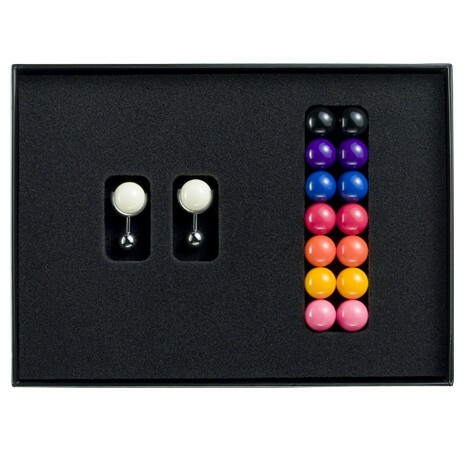 Set of cufflinks composed of sixteen 15 mm Bakelite balls (eight colours), steel caspule, 2.18 mm diameter steel wire and 9 mm steel ball. Cufflinks composed of 15 mm Bakelite ball, 2.18 mm diameter steel wire and 9 mm steel ball. Cufflinks composed of 12 mm Bakelite ball, 2.18 mm diameter steel wire and 9 mm steel ball.